There’s good rocking and there’s bad rocking. Most people enjoy a good sway in a hammock. But no-one enjoys the sensation of being violently swung from side to side when weathering a storm upon an inadequately equipped boat. Rocking chairs, designed though they are to foster feelings of comfort and reassurance, are surprisingly divisive. Many people find their gentle motion just right for soothing away the stresses of a long day and perhaps helping them on their way off to the land of nod. Others, however, simply don’t trust a seat that’s so unstable. If you fall into the former camp, read on – there’s sure to be a chair featured here that will catch your eye. And even if you fall into the latter category, why not read on anyway too? There’s a good chance you’ll become a convert. This chair strips away the sense of old-fashioned sentimentality that may traditionally be thought to accompany the rocking chair. It provides the basic functions of a rocking chair – i.e. rocking and sitting – with the minimum amount of fuss and embellishment. At the same time, though, it manages to steer well clear of austere utilitarianism. This is due to the fact that, although it is uncomplicated, it’s very noticeably been designed with great care. 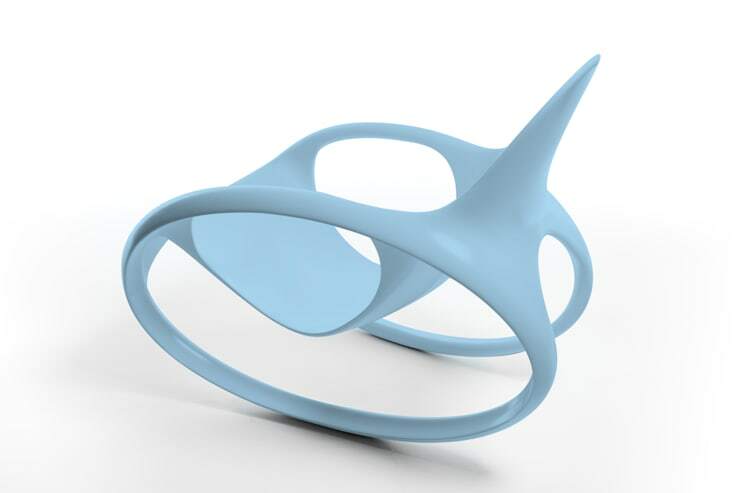 The struts which connect the seat to the rockers form a simple yet beautiful geometric pattern like the points of a star, while the rockers themselves are beautifully streamlined. 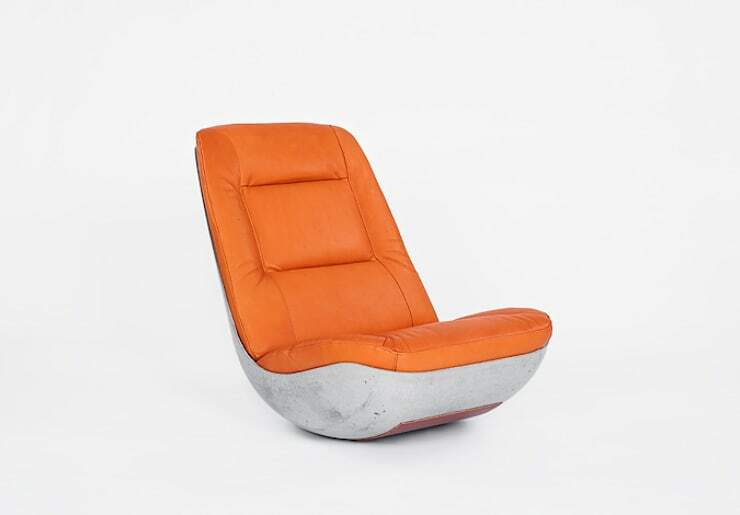 Resembling a strange hybrid between futuristic and vintage 60s styles, this comfy rocker is perfect for those looking for a bold statement piece for their living room. Not only is its form a totally unique one – making it likely to be the chair every guest naturally gravitates towards – its orange leather upholstery is so vibrant as to be almost insolent. No doubt about it, this is a chair with a bit of an attitude. Sunbathing is an activity that tends to have a soporific effect in any case, so keeping those eyelids open while gently swaying back and forth in this outdoor rocking chair would likely be a near-impossible feat. The chair’s silhouette is highly modern, but it uses strictly old-school materials – rope and wood – to create a rugged, outdoor appearance that contrasts strongly with its smooth, flowing lines. The gentle curves and organic shapes that make up this chair seem to have been lifted directly from nature, but the plastic used, colourful blue hue and non-existent decoration are all features of a self-consciously man-made aesthetic. The smooth ovals that act as rockers offer an inspired variation on the usual approach, where rockers are a separate piece. In fact this chair is one homogenous mass, absolutely seamless in its flowing continuity. This quirky rocking chair plays on the rustic associations of its breed. 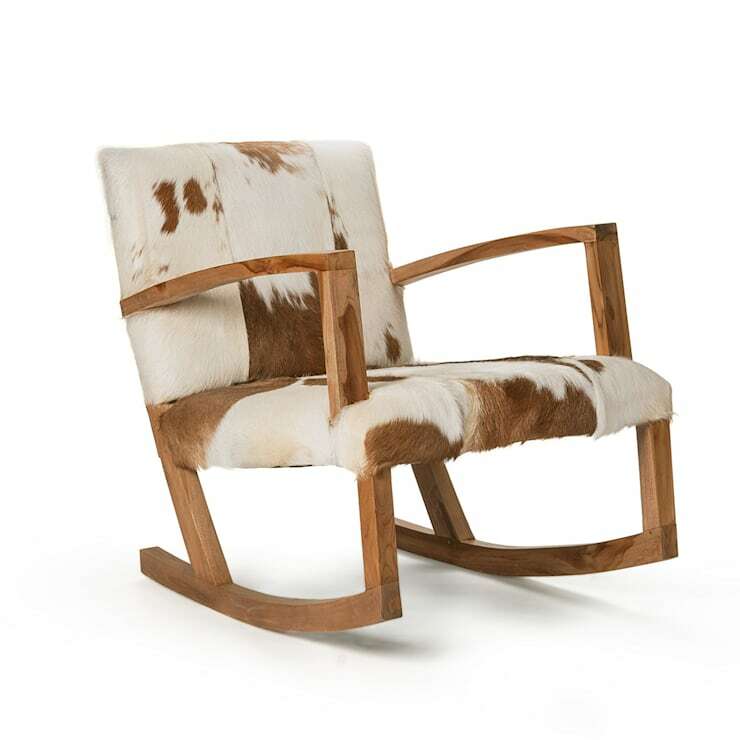 The cowhide upholstery would be the perfect fit for a ranch somewhere out in the middle of nowhere, surrounded by cows, of course – and quite possibly cowboys too. At the same time, though, the wood elements used here are sharply contemporary in their simplicity. This chair is only for those who are sure of their own tastes, and have the confidence to pull off such a domineering piece. And finally, a return to a more classic look. The traditional rocking chair seen on the right of this picture is perfectly at home in the tasteful comfort of the room that surrounds it. Its beautifully turned legs speak of good craftsmanship and attention to detail, perfectly in line with the quality of the rest of the furniture.